At What Do We Do All Day, Erica has advise for families whose kids range in age, but who still want to read aloud together. Is family read aloud time sometimes a little bit frustrating because your kids aren’t close in age? Maybe one child wants a board book and the other one wants a chapter book? What if I said you CAN read aloud to differently aged children at the same time AND keep the kids happy (while staying sane yourself). Greta Eskridge digs into stories that tell of the growing up of their protagonists–and her favorites among them. Melissa Taylor has advise on choosing your book series for your youngest readers–and some recommendations for you. If you haven’t read these books, let me explain something quickly– the goblins ALWAYS, in every book, are the bad guys. Trevin Wax has an interview with the creators of Every Last Word–a new Scripture songs project. I’ve asked Matt and Ross to join me today to give me some insight into how this project has come together. Jessica Burke looks at the hard things we do in order to grow–both physical and spiritual. Zach Franzen reminds us why Aesop’s fables with their simple morals are important for children. Stained glass windows do not make us treasure glass as much as they make us treasure light. The glory of stained glass windows, like the glory of creation, consists in showcasing that which shines through it. There are those who spend a great deal of time persuading others that the world around us is opaque –that there is nothing behind the world that we can treasure. Whether you’re stuck inside to beat the heat or fighting off a rainy week, here are some great games and activities for indoors. Super slow motion? Yes. 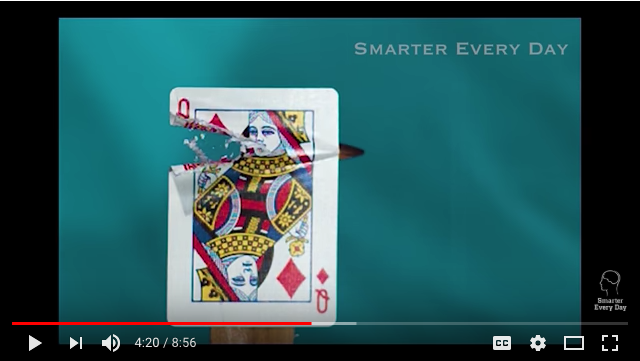 Bullet splitting a playing card in half? Yes.